Anger is a destructive act of aggression, causing others to withdraw or escalate. When we express the truth of our feelings, we forge aspace for connection, where the magic of human interaction becomes possible. Going beneath our anger allows us to lead constructively. There it was, out of my mouth before I knew I felt it. The morning routine had been rolling along fine until I brought up yesterday's lost lunch box -- yet another! -- and my son complained with a whine that he didn't know where it was. With the speed and intensity of an electric jolt, my mouth opened and a harsh and far too loud reprimand came tearing out. In the few seconds it took me to cool myself down, my son's whine became tears and my aggravation became horror. I'd done it again. Anger. Like a troll under a bridge, those of us who struggle with it never know when it'll leap out and attack. Meanwhile, those who live or work with temperamental people can carry dread of an unexpected blow-up. Issues with anger kept surfacing amongst our participants in our last "Personal Mastery" seminar. When I instigated an ad hoc discussion about how to more effectively manage anger, we discovered that all but one of the 70 participants struggled with their own anger or struggled to deal with other people's anger. It plays out in our workplace, often as irritated judgment, and at home, with those we care most about. Where does anger come from and what can we do about it? Anger is rarely, if ever, the deepest emotion at play when we lose our temper. It is a coping mechanism, a sign that something that matters to us is not as we want it to be -- and we feel powerless to change it. This last point is crucial. If we believed we could effectively change the situation, we already would have and wouldn't feel such intense frustration. We choose (unconsciously) to get angry because the powerful feelings of anger are less painful and uncomfortable than the more raw emotions beneath them. Feelings of powerlessness, inadequacy, shame and failure are common instigators of anger, and avoiding them helps me feel invulnerable, in control, and numb to what is hurting me in that moment. The first task in mastering your anger, then, is to identify and let yourself feel what is really at play for you. Once the wave of anger crashes to the shore, it often recedes quickly, and we move on -- even as those we got angry at nurse their bruises for days. In the aftermath, we may grapple with our behavior through guilt ("what I did was awful and I feel so bad"), rationalization ("I shouldn't have, but here's all the reasons why it was justified") or forgetting ("boy, do I need a drink"). All of these responses distance us from our ability to change by numbing the acute pain we feel about how we hurt the other person. At our core, the pain we cause in someone we care for can feel similar to shame in its intensity. As much as I want to flee these intolerable feelings, though, I have learned that they are my most powerful source of change. It is the highest part of my humanity crying out, "I don't want to behave that way; it's unacceptable." Letting ourselves feel these emotions compels us to take a stand with ourselves -- no matter what, I commit to never again unleashing my anger on others. The more our commitment is rooted in the costs of our anger, the more powerful its change potential is. Another time will come when your team is under-delivering, or a colleague in a sister organization is protecting his/her turf, or your child or spouse refuses to see things your way -- and the pressure cooker will steam to the boiling point. The key to mastering (not controlling) your anger is to notice the early warning signs -- the smallest emotions of discomfort or hurt -- and learn to constructively express them. Over the years, this has led me to admit to myself and others all sorts of things I preferred to keep secret: that I needed help, that I wasn't smart enough, that my feelings were hurt, that I felt inadequate, needy, like a failure. As uncomfortable as it is to tell my children I feel powerless in a situation with them, I've noticed time and again how dramatically it changes our interaction to something healthier. In so many of these cases, my entire body yearned to get angry; it was so familiar, so powerfully satisfying. Only my commitment, rooted in my awareness of the costs of my anger, was powerful enough to force me to authentically express my feelings at the first sign of irritation. Our greatest misunderstanding about expressing vulnerability is that we feel weak, when in fact we are at our most powerful. 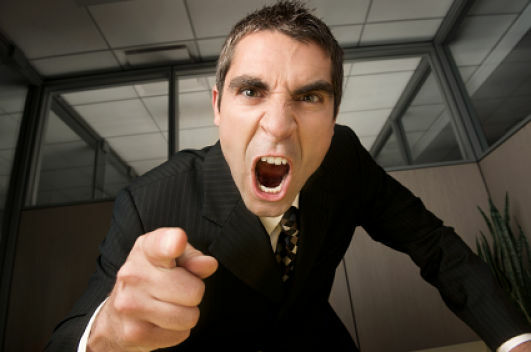 Anger is a destructive act of aggression, causing others to withdraw or escalate. When we express the truth of our feelings, we forge a creative space for connection, where the magic of human interaction becomes possible. Going beneath our anger allows us to lead constructively. What do you do when someone gets angry with you? Freeze, go into paralysis, and try to escape the danger as quickly as possible? Or tense with adrenaline, your skin turning red, and raise your voice right back? Fight frustration with irritation? In reviewing my own experience and the hundreds of leaders and employees, parents and children I have worked with over the years, our predominant reactions to anger tend to be flight or fight. Both of these self-protective responses are counterproductive. If I shut down and play small, waiting for the storm to pass, I allow the other person's anger to persist. There is no opposition or limit provided, and this can allow abusive relationships to form, whether physical, emotional and/or verbal. If I "get emotional" in response, the conflict often escalates. 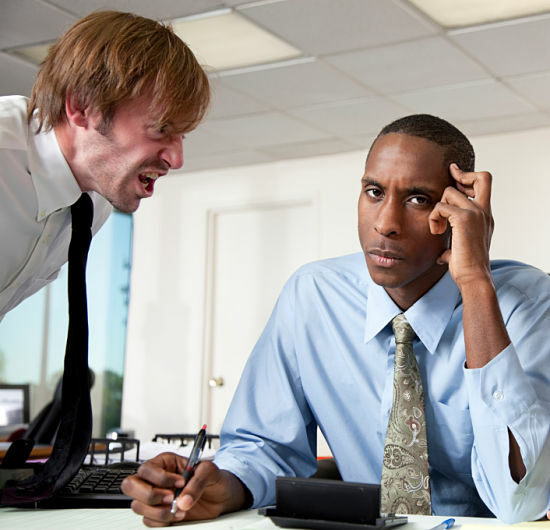 It is rare that workplace anger goes beyond words, but it does lead us to say things we don't mean. Relationships are strained, baggage forms, and months or years later, unhealed exchanges of anger linger. Many of us do both, depending on the situation and the person. We are threatened, and the survival instincts of our brainstem take over. "When you raise your voice," my youngest son stared me in the eyes, his gaze teary, his hands over his ears, "it scares me." He spoke these words over a year ago, and they stopped me in my tracks, in part because they were so different from my eldest boy's typical response to me. My firstborn can quickly lose his temper, and I end up dialing us back from a power struggle (look out, teenage crisis...). Or he cries, and leaves the exchange. But I actively talk about my temper, and how I'm working on it, so my younger son seems to have more distance from it. He sees it more as my issue than his fault. On the morning in question, he instinctively used his vulnerability to set a limit to my anger. His brainstem didn't take over, driving him to run away or put up a fight. He somehow kept his head, and verbalized what was true for him. "I don't like it when you do that." The power of his remark lay in how it confronted me with the unintended impact I was having on him. Without an aggression that I had to counteract, I was left with a mirror -- and I didn't like what I saw. He short-circuited the chain reaction that so easily happens when anger is introduced in a situation. This didn't mean, however, that I let go of the "content" of what I wanted to say; I used his response to recenter myself in how I dealt with the issue we were having. A primary goal when interacting with people who are angry, then, is holding them accountable to a more constructive behavior. (We could also describe this as having clearer "boundaries.") Counterintuitively, this takes a willingness to experience and express our vulnerability. Our default reactions of fight (suppressing our vulnerability and lashing out) and flight (being overwhelmed by our vulnerability and withdrawing) sidestep this discomfort. As with transforming our own anger, our power in transforming others' anger lies in our vulnerability. When we express our vulnerability directly, we access our ability to tell others what is or is not acceptable for us. None of this, of course, is a guarantee that we can change someone else. But in being clearer about how others' anger impacts us, and setting limits to it, we put others in front of a choice. If they want a relationship with us, they need to be committed to certain boundaries of acceptable behavior. I would love to hear your experience about your anger, or that of others', what you've learned, and where you're stuck. For more by Shayne Hughes, click here.